It's Easter 2012. I am staying in the Presidential Suite, The Sanctuary Hotel, Kiawah Island, Charleston. This will be my home for the next 10 days. I'm here with my dearest and best friend Andrew Rosenfeld. He decided that we should celebrate our 50th birthday in style. Andrew was 9 days younger than me. We will be playing the monster that is Pete Dyes "Ocean course". Home of the "war on the shore" 1991 Ryder Cup and many majors. 5 rounds of golf with caddies around this fantastic course and then off to the Masters for Friday, Saturday and Sunday. My suite was amazing and something I always like to do is have the balcony doors open so I can feel the ocean breeze and listen to the waves softly running out of pace against the soft sands of the beach. Wonderful to watch the sun rise and set, smell the sea air and just watch the people walking up and down with birds flying overhead. What with it being Easter and even more so in this part of the world, there was always something going on regarding celebrating the big man. One morning I was in my bathroom, naked, having a shave when I hear, knock, knock, knock. "Ok can you all gather round?" What was that I thought, oh no they are doing a room show round! "Hello, hello," I cry in a panic, "there's someone in here, there's someone in here. Please don't come in." "Don't worry we won't start without you, gather round"
"Don't come in this room this room is occupied, this room is occupied," I begged. "My name is Dean and I'm in this room, please don't come in" why I told them my name is beyond me! "No, No" I cried again with complete panic in my voice. With soap in my eyes, I thought right I have to go out there and face them, I grabbed what I thought was a bath towel, it wasn't it was a small face flannel which was more than adequate to cover my blushes. I ran out with both hands in front of me. Nothing, no one, I ran into the lounge area, nothing. I went back to my room, nothing. Went to the balcony to see if they went to the next room, nothing. Looked down at the beach and there were about 50 or so people with others walking towards the gathering crowd. The knocking I could hear was the priest knocking on his microphone then asking for everyone to get together so they could start the sermon. "Jesus came to earth he cried" he could have waited another half an hour I thought. The brand new Epic driver from Callaway is rightly grabbing plenty of attention. Not only with the tours around the world but also with our members. Many who have tried them are saying that they are hitting the ball between 15 and 20 yards further with a wonderful feel off the club face. So most members will hit the driver 12 times in a round of golf. That's an incredible 240 yards you will be taking back from the golf course. So here's the deal from your pro shop. We will create the Epic driver to suit your game. You then take it out on the golf course, won't get that anywhere else! You can try different shafts and different lofts. Now, I know how hard it is to earn money these days and this driver is up there in price. This is what I would like to do for you. The cost is £425 , this is your price as a member. This price is beating all the discount shops out there. First payment £125 then you can pay the rest of the balance in the next 3 months, you won't get that anywhere else! Please remember Dean, Tom and myself are here for you all. Anything you need just come and see us, if we can help we will. 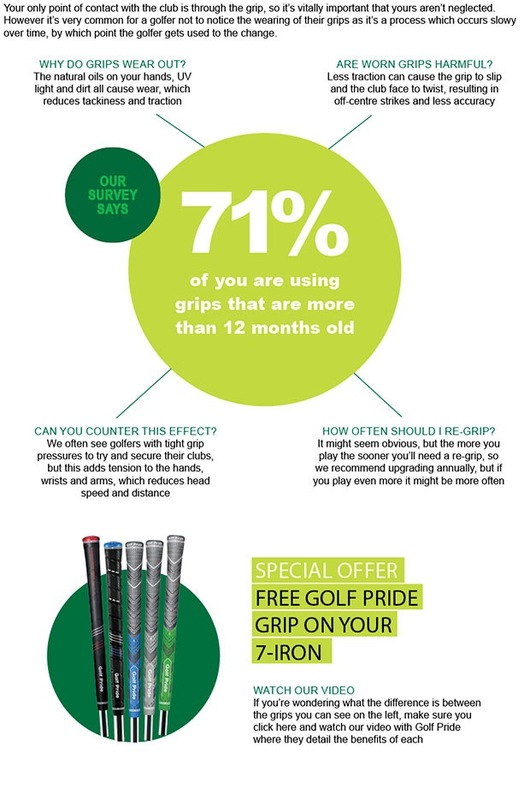 Our 2017 promotional campaign gets under way this week, we have teamed up with the #1 grip supplier Golf Pride to offer you a FREE re-grip on your 7 iron. Take a look at your grips, you may feel they are ok but if you compare them to a new grip you will be surprised at the difference. Even though they may not look worn, grips get harder and a bit shiny over time, the consequence is that you start gripping the club harder which leads to poor shots and higher scores. Come in and look at the different grips available and get your season off to a good start. Tom Kearns is building a fine and founded reputation as a coach. Many members have come in to me and said that they are really enjoying his lessons and they can see the improvements in their games. Tom is offering the Game Changer Package in 2017. 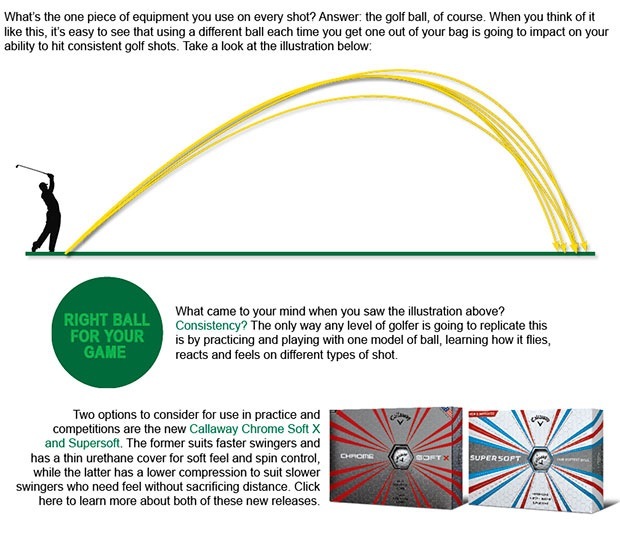 10 Lessons will get you an overall synopsis of your game, email feedback, video analysis and two free lessons if you do not see a handicap improvement after the initial 10. You would have thought I would have learned by now. After getting Hyun-Ji fitted for her new Callaway clubs she came down for a lesson and I said "ok, the course is playing long, its wet and playing really difficult, so here's the bet, I will give you a dozen balls if you can go out there and shoot better than 14 over gross."